For many, for decades, Carl Sagan’s name was synonymous with astronomy. It was Carl Sagan who said, “We’re made of star stuff. We are a way for the cosmos to know itself.” Image via Dab’s Magazine. November 9, 1934. Today is the anniversary of the birth of astronomer and astronomy popularizer extraordinaire Carl Sagan. 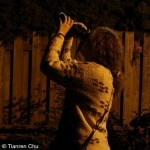 Most of us are familiar with this late American astronomer through his books and television series Cosmos. Sagan also contributed greatly to the field of planetary science and monumentally – perhaps immortally – to the American space program. Carl Edward Sagan was born on November 9, 1934 in Brooklyn, New York. He studied physics at the University of Chicago and earned his doctorate in astronomy and astrophysics in 1960. In the 1960s, one of Sagan’s earliest works in professional astronomical research shed light on the atmospheres of our solar system’s planets. The atmospheres of Mars and Venus, for example, are known now to resemble that of Earth. But in Sagan’s day, scientists were still trying to understand how come Mars could be so cold while Venus is so hot. Sagan successfully confirmed that Venus could be a greenhouse furnace by using data from tables for steam boiler engineering. Around this same time, Sagan became interested in the search for extraterrestrial intelligence (SETI) and contributed much to it. He proved that the building blocks of life could be easily created by exposing simple chemicals to UV light. In 1966, he helped I. S. Shklovskii, a Soviet astronomer and astrophysicist, revise and expand his classic book on extraterrestrial life, Intelligent Life in the Universe. In 1971, Sagan was denied tenure at Harvard University; some speculated it was due to his controversial opinions on extraterrestrial intelligence. He went on to become a professor at Cornell University in Ithaca, New York, where he spent the rest of his professional career. Sagan contributed mightily to the U.S. space program. Among other things, he briefed astronauts before their trip to the moon, and he was part of the Mariner, Viking, Galileo, and Voyager space missions. In the Viking missions, for example – two probes sent to explore Mars in the 1970s – he advised on the choice of ideal landing sites. 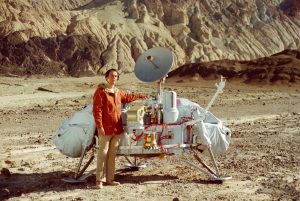 Carl Sagan poses with a model of the Viking lander in Death Valley, California. Image via NASA. But, in addition to his books and the Cosmos television series, it’s Sagan’s actual messages to the cosmos – placed aboard the first spacecraft designed to leave our solar system, on the Pioneer and Voyager missions – for which he’s most remembered. The original idea for the Pioneer plaques – a pair of gold-anodized aluminium plaques carrying messages from humankind, placed aboard the 1972 Pioneer 10 and 1973 Pioneer 11 spacecraft – originally came from journalist and consultant Eric Burgess. He approached Sagan about it, and NASA agreed to it and gave Sagan three weeks to prepare a message. Together with astronomer Frank Drake, who formulated the famous Drake Equation (a way of estimating the number of intelligent civilizations in our Milky Way galaxy), Sagan designed the plaque, with artwork prepared by his wife at the time, Linda Salzman Sagan. The Pioneers and the plaques they carry are now billions of miles from Earth (but still within our sun’s influence). But eventually they’ll cross out of the sun’s influence, into the realm between the stars. 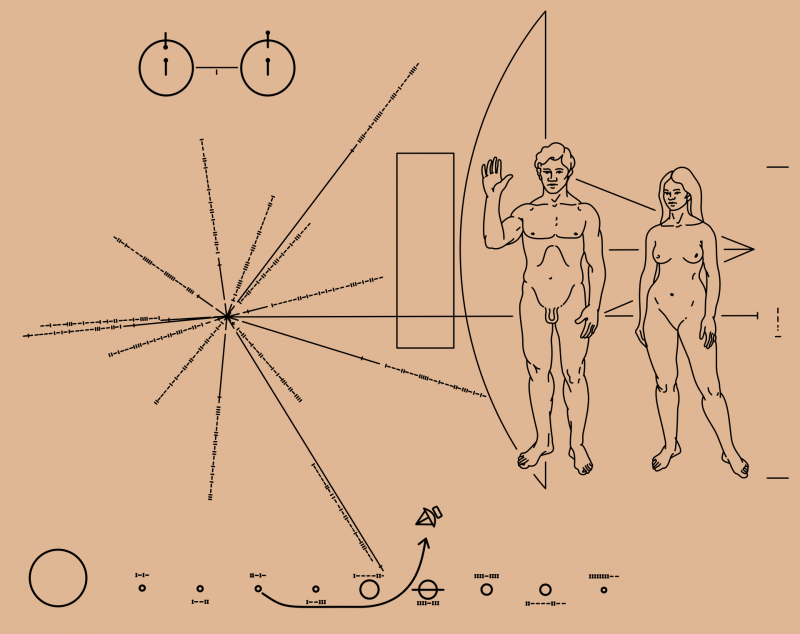 A Pioneer plaque, which Carl Sagan helped design and place aboard the 1st 2 spacecraft ever to leave Earth for interstellar space, via Wikimedia Commons. Later in that same decade, in the late 1970s, Sagan and his wife-to-be, Ann Druyan, contributed to the design of yet-other message from humankind to outer space. 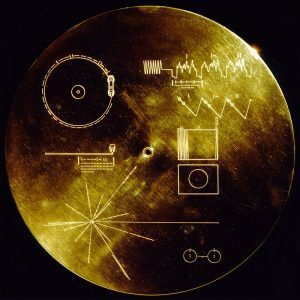 The Voyager probes were launched in 1977, and they both carry what is known as a Voyager Golden Record. Each Golden Record contains 116 images that depict historical scientific works and humans performing mundane activities, plus music from artists such as Bach, Mozart, and Chuck Berry, an hour-long record of Ann Druyan’s brainwaves, and greetings in 55 languages. Click here for a list of all the material on the Golden Records. Listen to the entire musical selection of the Golden Records. The Voyagers were launched later, but traveled faster than the Pioneers. Voyager 1 is now considered to be in interstellar space. It is the farthest object from Earth that is human-made. Voyager 2 is somewhat closer and is still in an outer region of our sun’s influence, known as the heliosheath. Click here to see where the Voyager probes are, in real time. The Golden Record, NASA/JPL, via Wikimedia Commons. During the 1980s, Sagan encouraged nuclear disarmament and was one of the five authors of the concept of nuclear winter, which describes the aftermath of a nuclear war. The work showed once and for all that, in a nuclear war, no one would win. It’s hard to estimate the importance of this work to the global consciousness of the time, but it’s perhaps no accident that the cold war ended not long afterwards. 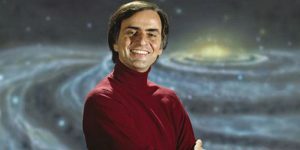 Carl Sagan remained at Cornell until his death on December 20, 1996 at age 62 from pneumonia. Do you remember him? Do you remember his words and the sound of his voice? Listen and remember, via the video below. Bottom line: Carl Sagan was born on November 9, 1934. He is most remembered for his efforts in popularizing science through his books, for his television series Cosmos and for his messages to the cosmos placed on the Pioneer and Voyager spacecraft.